What makes up the 2014 Computing National Curriculum? How has the Computing National Curriculum changed? Why is the inclusion of Computer Science important? Is the Curriculum all about programming and computer science? 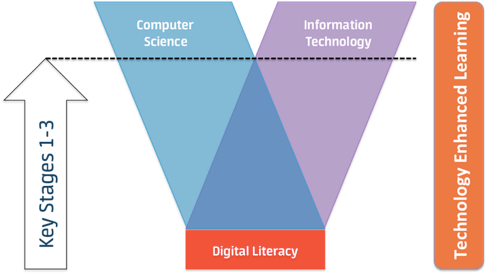 How do Computer Science, Information Technology and Digital Literacy fit together? Where can I get help on the terminology in the curriculum? Should I really be using it with my learners? How can I use guidance from the educational community in a useful way? How do these changes affect the classroom? What is the relationship between skills and knowledge? What do I have to teach my learners in Computing? 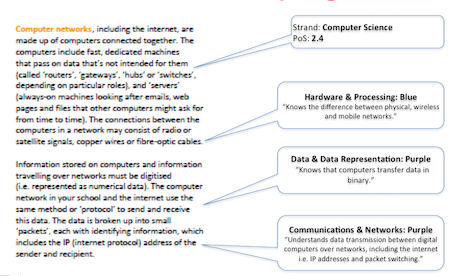 Is it compulsory for my school to provide us with CPD to teach the Computing curriculum? Is there a skills audit to understand what subject knowledge I need for a given age group? Where can I find help if I'm new to teaching computing? From September 2014, the National Curriculum has changed to include more Computer Science alongside what we would traditionally know as ICT. 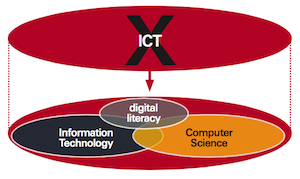 ICT is split into two official strands: Information Technology and Digital Literacy, as suggested by the Royal Society report of 2012. Along with this content change, the subject has been renamed Computing. In the 2014 Programmes of Study, the opening paragraph states that the purpose of the Curriculum is to "equip pupils to use computational thinking and creativity to understand and change the world around them." "A high-quality computing education equips pupils to use computational thinking and creativity to understand and change the world. Computing has deep links with mathematics, science and design and technology, and provides insight into both natural and artificial systems." This new emphasis on thinking skills and creativity provides a fantastic opportunity to enhance current approaches and provide even more exciting and rigorous curriculums for learners. The inclusion of more computer science into the new National Curriculum is important. If learners are expected to become independent learners, evaluators, and potential designers of new technology, then they must understand the concepts and principles these technologies are built on. There is an inspirational TED talk about teaching Computer Science creatively by Professor Simon Peyton Jones, Chair of Computing At School. The new Computing Curriculum is not just about programming - but it is part of it. Programming bridges the gap between good thinking and computers. It is far more important that the breadth and depth of the whole subject of Computing is interpreted correctly, ensuring that it meets the needs of learners when they progress to the next stage of education or employment. It is key that learners are provided with a balanced curriculum, containing all three of the official strands of Computing: Computer Science, Information Technology and Digital Literacy. This should be provided through Key Stages 1-3 (aged 5-14), so that learners have the solid foundations required for a Computer Science, Information Technology or Digital Media related qualification at Key Stage 4 and beyond. Miles Berry’s explanation of the relationship between Computer Science, Information Technology and Digital Literacy is good. Miles is a lecturer at Roehampton University, and a former Prep School Head Teacher. He describes Computer Science as the ‘foundations’ of Computing, Information Technology as the ‘applications’ of Computing, and Digital Literacy as the ‘implications’ of Computing. "The core of computing is computer science, in which pupils are taught the principles of information and computation, how digital systems work and how to put this knowledge to use through programming. Build on this knowledge and understanding, pupils are equipped to use information technology to create programs, systems and a range of content. Computing also ensure that pupils become digitally literate – able to use, and express themselves and develop their ideas through, information and communication technology – at a level suitable for the future workplace and as activate participants in a digital world." The SSAT document ‘Why Change is Needed’, part of the Redesigning Schooling series, asks some important questions about what learners needs could be in the future workplace and in a digital world. On a more practical level, there is an excellent series of videos created by Southampton University called ‘Why Computing’. One of which considers why these changes came about and examines the contents of the new Computing curriculum (including what is Computer Science, Information Technology and Digital Literacy) and how it could be taught. Between the ages of 5 to 14, learners should see the one subject of Computing, not the separate official strands. Gradually, as they approach their Key Stage 4 qualifications, learners should become more aware of the strands and the qualification paths available to them. Much of the terminology in the 2014 National Curriculum can appear new. 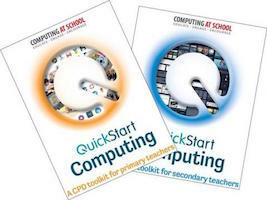 The Computing At School (CAS) Primary and Secondary guidance documents, CAS QuickStart Computing and CAS Computational thinking guidance for teachers are recommended reading for all. For the specific pages relevant to each FAQ guidance document please refer to our reading list. It is important to use the correct terminology with your learners. The word 'algorithm' is no more difficult to understand than the term onomatopoeia, which is taught to learners during their primary education. In one of the author’s lessons entitled ‘Computing and Dance’, he was trying to teach the learners about abstraction, generalisation and algorithmic thinking. During the lesson, one of the learners turned to him and said "Mr. Dorling… would you please get with the algo-rhythm!" because he can’t dance and was about three steps behind the class. This really helped the learners remember what the word meant and the intended learning outcomes. How can I use guidance from the educational community in a coherent and useful way? A grassroots membership organisation called Computing At School (CAS) is leading the way on developing curriculum advice to support teachers with implementing the Computing curriculum. They have worked with a range of organisations including the Department for Education, Microsoft, Google and Raspberry Pi to create guidance for teachers. Step 1: Read the National Curriculum Programmes of Study and highlight the words that you don't understand. Then read the CAS Primary guidance (pages 4-13) or CAS Secondary guidance (pages 6–15). Step 2: Cross reference the National Curriculum Programmes of Study with the relevant CAS guidance document. The key words from the National Curriculum are in bold and a different colour in the guidance documents. 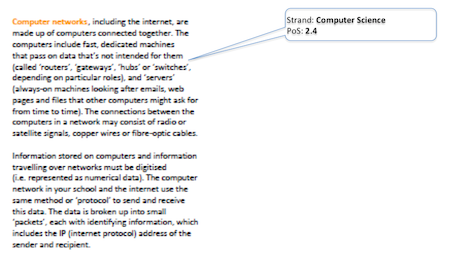 Place the page number from the guidance document above the key word from the national curriculum. Then place the National Curriculum Key Stage and bullet point next to the paragraph in the guidance document. Secondary colleagues may find it beneficial to read and cross reference the Primary document as well. Step 3a: Map the learning statements in the Computing Progression Pathways to the relevant CAS guidance document. The explanations for each topic in the CAS guidance will progress in the same order as the learning statements in the Computing Progression Pathways. 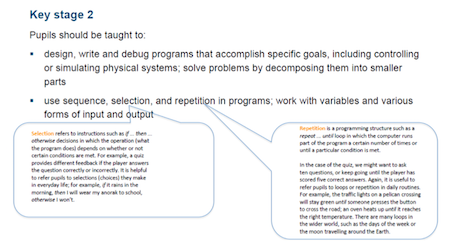 The relationships and interdependencies between the learning statements in the topics (columns) in the Computing Progression Pathways will start to become apparent. Step 3b: Initial Teacher Training institutions who reviewed this guidance, suggested that for Trainee Teachers, the process of mapping the documents from Step 3(a) into the statements from the Department for Education’s Subject knowledge requirements for entry into Computer Science teacher training can be an incredibly valuable process to support the Skills Audits available. Step 4: If there are key words in both the CAS guidance documents and Computing Progression Pathways that are unfamiliar, then further explanation can be found in the CAS QuickStart Computing documents, together with a range of other resources listed in the Further Reading section of this guide. As the subject knowledge requirements for secondary colleagues are much greater (and wouldn't fit into a short booklet) the CAS QuickStart materials focus on ‘managing the transition from ICT to Computing' but recommend a range of great publications (books and MOOCs) on page 45 and 50 - 52 that could support your subject knowledge development needs. The CAS Secondary QuickStart materials has focused mainly on "Managing the transition from ICT to Computing" but it does recommend a range of great publications (books and MOOCs) on Page 45 and 50 - 52 that could support further development of subject knowledge. Step 5: Get started with managing the transition from ICT to Computing! There is more information in: Managing the transition from ICT to Computing. Computing’s origins lie in philosophy and asking the question, 'Why?'. Guidance from the educational community suggests that a quality Computing education is no different! This can be achieved in Computing classrooms by making relevant links to other subjects and wider, real life situations. 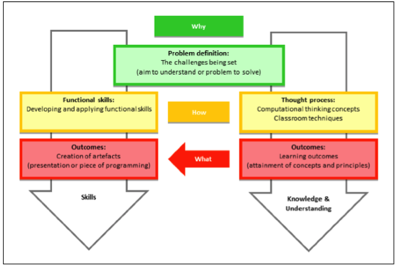 The 'how' of Computing is where learners develop and apply a range of computational thinking skills to understand or solve problems. 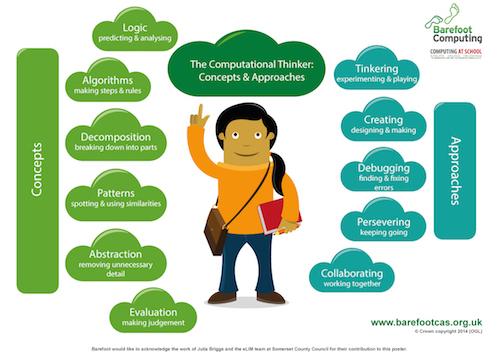 This has obvious similarities with mathematical and scientific thinking and is achieved through teachers employing a range of computational thinking techniques outlined in the CAS Computational Thinking Teachers' Guidance. The 'what' is expressed through the evidence of the actual subject learning made by learners. These match the learning outcome statements from the Computing Progression Pathways. Where appropriate, learners should be using these skills (the how), to produce an artefact (the what). The artefact could be a video, podcast, presentation or piece of programming. The content should be based on the 'what' of the particular subject's knowledge, be it Literacy, Geography, Science, Dance, Art, or even Computing! Learners need to develop their skills in parallel with the knowledge and understanding of the subject. This is of real importance if we are to fully support their future employment and educational needs. Along with developing and using the functional skills of 'how' to use the technology. The solution or product that a learner produces whether it is a video, podcast, presentation, design, an algorithm, or code is used to solve a problem that is the 'what'. The content for these activities is to be based on the subject content knowledge and the understanding to be developed by the learners. 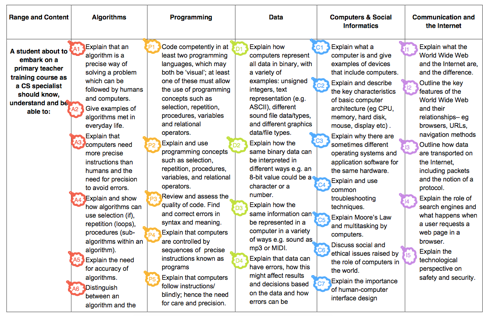 The Computing Progression Pathways describes the detail of the curriculum content, which in turn has been developed by identifying the associated computational thinking skills. This provides the rationale or the 'why' that underpins the lesson or learning sequence. The challenge is how to understand the breadth and depth of the curriculum, and then plan and assess the resulting lessons. "The National Curriculum is designed to cover the essential knowledge and skills pupils need by aged 16. It is deliberately short to allow teachers the flexibility and freedom to teach a curriculum, and expand upon it, in a way that best meets the needs of their pupils." "the breadth of the curriculum and how well it is based on accurate assessment of children’s learning and development, so that activities and experiences meet their needs"
This feedback from the Department for Education and Ofsted highlights that the Programmes of Study are the minimum expectation for learners and we, as teachers, have the freedom and flexibility to expand upon it. Enabling the development of curriculums that meet the learners needs and assessment criteria that matches these curriculums. 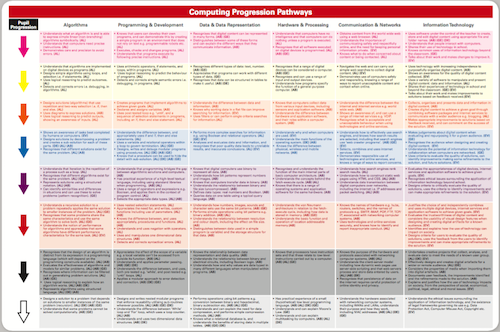 The Computing Progression Pathways is one highly popular interpretation of the subject of Computing which is used in schools. The Computing Progression Pathways is a non-statutory document. It should be adapted to reflect school curriculum, in turn the school curriculum should meet the needs of the learners' i.e. their future education and employment needs. For further guidance on practical steps for implementing a Computing Curriculum, planning and assessing Computing lessons to make the aims of the National Curriculum and assessment without levels a reality, check out the Innovate My Curriculum FAQs on "Managing the transition from ICT to Computing", "Planning Key Stages 1 – 3" and "Managing assessments in Key Stages 1-3". Putting this challenge into context: Maths and science have had hundreds of years to develop effective pedagogies and have been around as subjects for thousands of years. In comparison Computing is perhaps 60-70 years old, hasn't been taught in schools for about the last 20 years and pedagogy has moved on immeasurably since then. The subject has some catching up to do! Together with changes to the National Curriculum and abolition of assessment levels, this is a really exciting time. It’s a once in a generation opportunity to be able to explore new pedagogies and actually define a new subject moving forwards. Reflecting on these experiences is part of professional development: sharing pedagogical experiences of both what works and what doesn't work with our community is key. This needs pedagogical risks to be taken. Without risks, the subject of Computing can’t develop. No, it isn't compulsory for schools to provide Continued Professional Development on Computing. "The three essential strands of teacher expertise relate to pedagogy, curriculum and assessment. The Commission believes that beyond ITT every teacher should have the opportunity to become skilled and confident at assessing pupils’ learning." "the quality of continuing professional development for teachers at the start and middle of their careers and later, including to develop leadership capacity and how leaders and governors use performance management to promote effective practice across the school." teachers and other staff have a secure understanding of the age group they are working with and have relevant subject knowledge that is detailed and communicated well to pupils"
Therefore, it is important to justify to senior leaders the need to obtain CPD to develop subject content knowledge, subject pedagogical knowledge and assessment of Computing to ensure that learners are consistently set high expectations. Skills audit can focus on two things. Firstly, a generic focus on ICT skills needed for teaching Technology Enhanced Learning and Digital Literacy, and secondly concentrating on the skills and knowledge required to teach the subject of Computing. This question will focus on the second of these. The Department for Education has subject knowledge requirements for entry into Computer Science teacher training. These requirements were developed by industry experts and education professionals. These subject knowledge requirements maybe a useful reference when justifying the need for CPD with senior leaders. 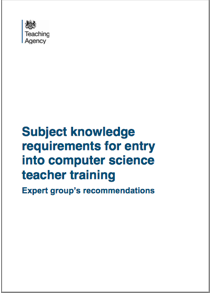 This tool includes a series of questions based on the Department for Education recommended subject knowledge requirements for Computing teachers. Two assessments are available: one for primary teachers and another for secondary. The diagnostic tool comprising of 25 to 30 multiple-choice questions that span all areas of the Computing Curriculum at primary or secondary level. After completing all the questions, the results will be displayed onscreen. These results are broken down into the curriculum areas to assist with identifying CPD needs. The academic research into what makes highly effective CPD for teachers suggests that it needs to be collaborative, sustained and focused on outcomes for learners. The amount of time needed to see an impact in the class can vary depending upon the study but typically it is between 15 and 30 hours. There is an excellent one A4 page summary with a list of further reading available in the CAS QuickStart Computing project to get you started. We recommend signing up for a free membership of CAS. CAS has a diverse and growing membership of supportive membership of teachers, academics, school governors, industry professional, all of whom are working together to improve the quality of Computing education. Another option is to consider purchasing the Stuck for Schools video tutorials based on the lessons and resources from the Rising Stars Switched On and Hodder Education Compute-It series. These feature the essential coverage of all key topics and strategies for delivering lessons in computer science. The videos feature Miles Berry and Peter Kemp from Roehampton University. Watching these can help identify approaches for teaching Computing through Key Stage 1 – 3. Department for Education, How can the Computing At School group help you? Computing At School, What makes highly effective CPD? Cordingley, P., Bell, M., Thomason, S. and Firth, A., The impact of collaborative continuing professional development (CPD) on classroom teaching and learning. Review: How do collaborative and sustained CPD and sustained but not collaborative CPD affect teaching and learning? Guskey, T. and Yoon, K., What Works in Professional Development?